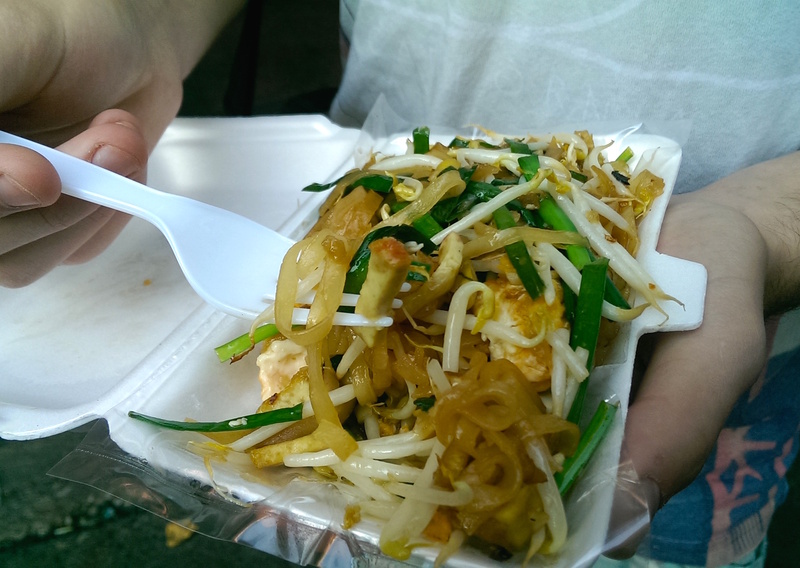 There's no doubt that the world has fallen in love with Thai food. I don't think I've ever met someone who says they don't like it. I probably wouldn't trust them if they did! Joking aside, it's definitely my go-to fast food, and great for healthier lighter meals. This time of year always gets me thinking about Thailand as I've spent so much time there during our winter months. Last year I had noodle soup for my Christmas breakfast. I just love noodle soup. I might have to make myself some for breakfast this year to warm myself up in rainy old Manchester. There are so many more dishes I wanted to include in my book, and I'm going to add them to the website recipe page soon. But here's my favourite lucky seven dishes from the Land of Smiles. This famous noodle dish has travelled to menus around the world and is definitely my family’s all time favourite street food in Thailand. I wouldn’t be surprised if it was the most ordered dish on any South East Asian restaurant menu. This dish perfectly represents the sweet, salty and sour elements of classic Thai food with lip-smacking tamarind, soft rice noodles and crunchy vegetables. I could eat it for breakfast, lunch and dinner! 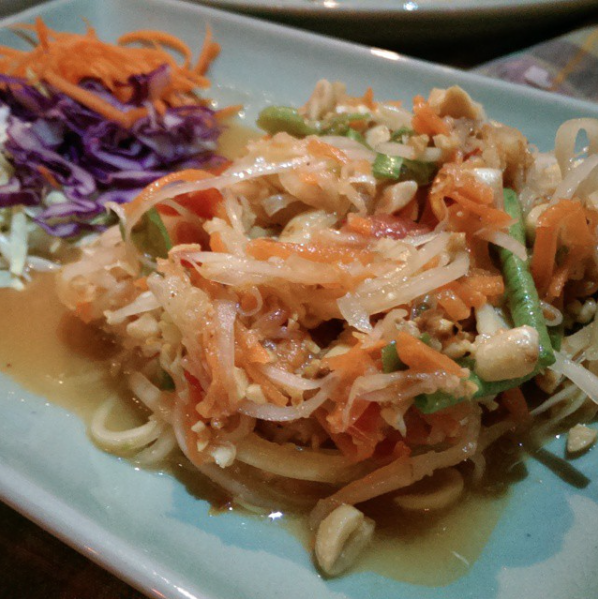 Nam prik pao is a type of roasted Thai chilli jam. Not like the sweet sticky dip you often see served alongside dumplings and rolls, but a deep, dark and spicy paste used in stir fries and noodles. The paste is often used in stir-fried rice, or as my family have nicknamed ‘bus station’ rice because it was always our go-to veggie dish when we made a station stop. This is a super easy dish to make at home and you can follow my easy recipe here. The ubiquitous noodle soup can be found on every street corner across Thailand and the variations are endless. Rice or egg noodles, meat, seafood and tofu with a variety of greens, the dish can be seasoned and spiced according to taste. 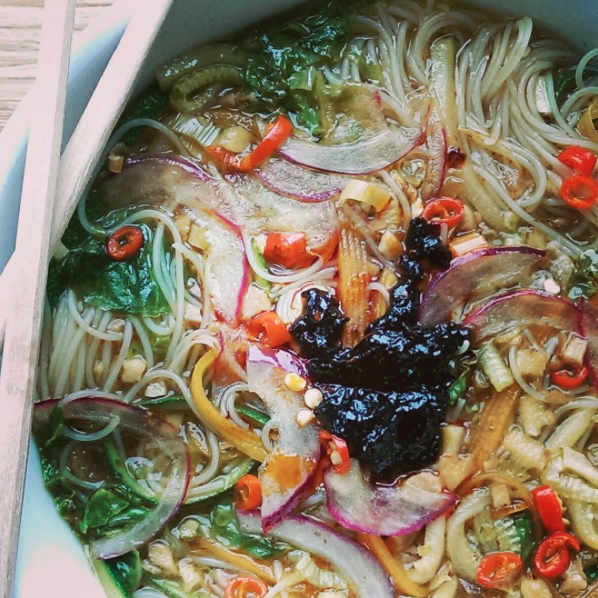 My favourite noodle soup recipes can be found in my book Vegan Street Food. The name of this classic Thai dish means stir-fried holy basil, referring to the unique and fragrant SE Asian herb. I like the veggie version fried with aubergine, but traditionally it is prepared with chicken (gai) or pork (moo). Perfect with some sticky rice on the side. Another huge crowd pleaser from the Land of Smiles! Everyone seems to love this fragrant and spicy curry, rich with coriander, green chillies and more of that delicious holy basil. I love the variety of unusual vegetables when I’m travelling, like pea aubergines and green jackfruit, but it’s an adaptable dish to more local produce too. It’s all about the flavour of the deeply fragrant broth, served with some lightly steamed jasmine rice. If this isn’t the best salad in SE Asia then I don’t know what is! I won’t lie, you need to like your chillies to enjoy this one, but the perfect balance of spicy, sweet, salty and sour combined with crunchy vegetables, elevates this dish above and beyond it’s simple ingredients. Perfect mangoes are the secret to this dish so I tend to make this at home when they are in season and at their best. You’ll have to see the recipe in my book to find out my other secrets for perfecting this dish at home. 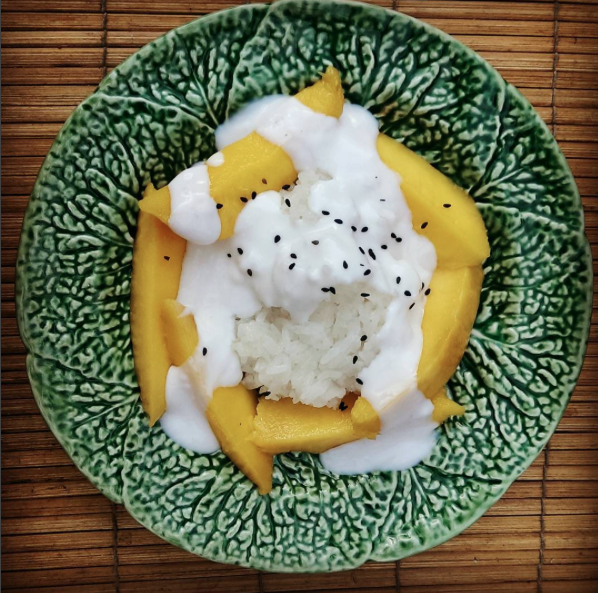 If you love the idea of salted caramel and tropical fruit, then you’ll probably love this dish! 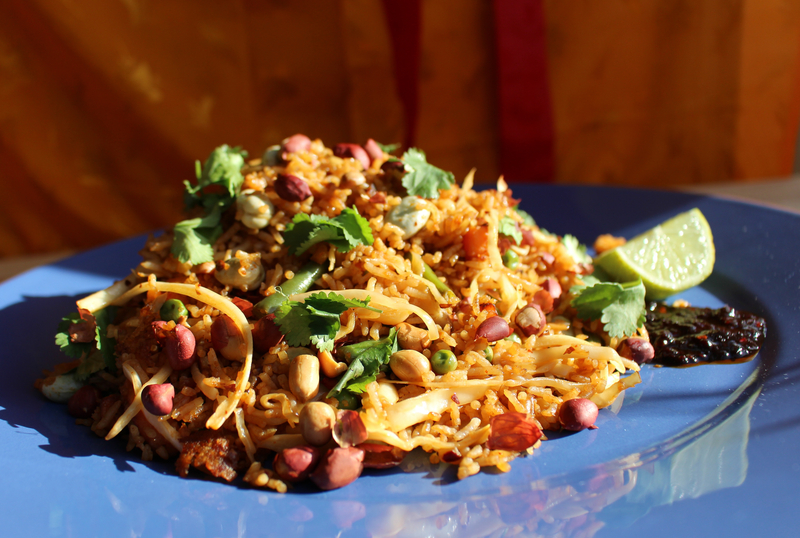 Recipes for you to make these dishes at home can be found in my book Vegan Street Food, published by RPS/CICO Books. Prefer someone else to do the cooking? 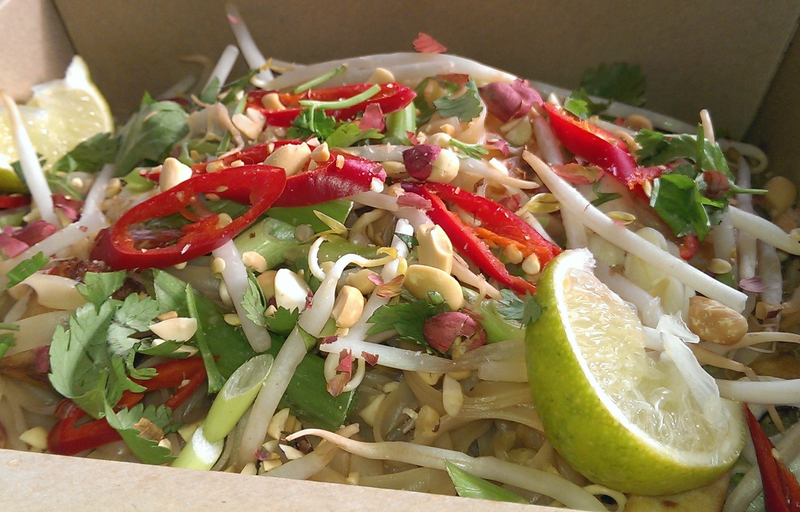 Pad Thai, Pad ka prao and Thai green curry can all be found on the menu at Tampopo & East Street restaurants, alongside lots of other SE Asian favourites. Tampopo’s newly refurbished restaurant is now open in Manchester’s Corn Exchange. Fancy reading about my favourite places to visit in Thailand, check out my blog for Tampopo here.